Pikachu power: Can it transform the energy industry? University of Minnesota, Duluth, is asking students to clear storm drains near Pokemon. Photo courtesy of University of Minnesota, Duluth. Can Pikachu help save the planet? As the Pokemon Go craze continues, everyone from the national labs to universities are highlighting how the technology behind the game may advance environmental research and revolutionize the energy sector. Others are showcasing how the game itself can improve the environment and educate people about it. 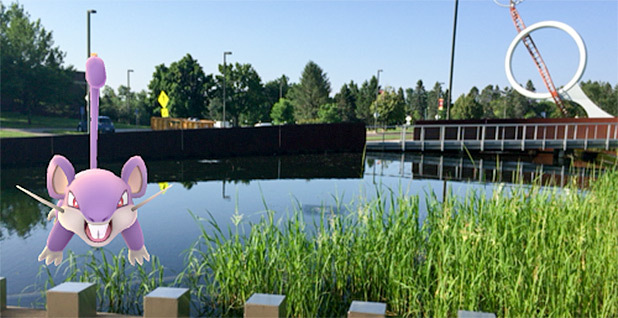 The University of Minnesota, Duluth, for instance, is urging students to reduce water pollution and clean storm drains while roaming with cellphones. "While you are out catching Pokémon, why not help us catch illicit discharges?" the college says on its website. Oak Ridge National Laboratory, meanwhile, is outlining in a video this month how researchers are using the same geographic information system (GIS) as in the game to assess things like energy and water demand. Similarly, the Electric Power Research Institute (EPRI) is blogging about how the game's technology resembles what it is testing with multiple utilities to possibly achieve double-digit efficiency improvements in the electricity system. Then there is NextGen Climate, the group backed by billionaire environmental activist Tom Steyer, which is targeting Pokemon hotspots to find new supporters and hosting events with solar-powered charging stations. "We're showing young people that registering to vote is easier than catching the elusive Pikachu," said Suzanne Henkels, a spokeswoman for the group. More broadly, experts say the field of augmented reality — the general sector that Pokemon Go belongs to — could permanently change how energy workers and environmental scientists do their jobs. "We're seeing a lot of interest in the energy space," said Eric Abbruzzese, a senior analyst at ABI Research, which forecast this year that the augmented reality market would grow from about $7 billion today to $115 billion by 2021. Oil and gas companies, for example, are tapping the technology to repair oil rigs. The industrial sector, which includes energy companies, is expected to make up around 44 percent of the total smart glasses revenue market within five years, according to ABI. Among those interested is EPRI, which is working with at least seven utilities to test how various types of augmented reality applications may improve everything from worker safety to equipment repairs. Duke Energy Corp., the New York Power Authority and Consolidated Edison are among the partners. EPRI plans to release a report on its findings after the project ends next spring. The Pokemon Go app from Niantic Labs overlays cellphone camera images of the real world with random Pokemon, or creatures with names like Pikachu and Squirtle. Users can then capture the virtual creatures in front of them with Poke Balls on their cellphone. In a similar way, other types of augmented reality technology can insert 3-D diagrams, rotating structures, color-coded maps and pictures into the field of vision of workers using AR-equipped devices. Because utilities typically have a database of where all their assets are based on GIS, the information can be tapped to create an "overlaid reality" in a pair of goggles, or on a tablet or phone. John Simmins, a technical executive leading EPRI's augmented reality work, explained how the technology could be pivotal after a power outage. By wearing a helmet or glasses that show what a given location is supposed to look like, a worker can quickly see whether a hard-to-find power line or a transformer on a pole is missing. The information can then be sent quickly to headquarters with a voice command or wave of the hand sensed by the device. After a major storm, people who are dispatched to assess damage may not have as much expertise as typical line workers, Simmins said. "It can really shorten the amount of time that the outages exist before they get worked on," he said. It also can cut down on errors. Simmins described a scenario where utility workers might have trouble finding a manhole because snow is piled up and cars are parked everywhere. A helmet or goggles with transposed images of a carless, snowless landscape would guide them to the direct spot. Then, if the same worker in a manhole locates an old piece of equipment that is unrecognizable, augmented reality could help identify it via a floating box like an airborne Post-it note. Or it could also bring up a manual in front of the user's eyes to show how to quickly repair it. An EPRI video demonstrates the idea with an AR-equipped employee inspecting equipment through his helmet without having to use his hands or piles of paperwork, completing what is normally a two-step process in a small fraction of the time. The technology could be lifesaving, too. During some electricity repairs, there is the danger of an "arc flash" where corrosion or dust on equipment can cause electric current to travel through the air from one conductor to another, potentially resulting in a huge fireball. Augmented reality glasses have sensors that can detect when such a malfunction is about to happen and "provide a visual warning," said Simmins. Abbruzzese said companies like Daqri that make augmented reality helmets are seeing so much interest from the oil and gas sector partly because it's an industry where hands-free usage is critical and hard hats are required anyway. Among other things, the technology can help train workers to use complex equipment when a system expert is off an oil rig. In such a case, the off-site "teacher" could connect to the AR device, then control what a user thousands of miles away sees by overlaying images in his or her visual field of reference. That could include floating pages from a user manual, hovering boxes flagging a specific error or a rotating circle over a piece of equipment showing which way to turn something in the right sequence. In an advanced system, a "teacher" can pull up a 3-D diagram of a machine and highlight different components individually, Abbruzzese said. In an op-ed this summer, Maersk Oil engineer Martin Kaster said he envisioned a future where all oil platform workers used AR to identify escape routes from the platform, get instantaneous data on things like the temperatures of pipes and perhaps "digitally identify engineers new to the rig." Steven Feiner, an augmented reality expert at Columbia University, said the growing use of augmented reality in businesses generally could have a tangible side benefit in reducing transportation emissions, by eliminating the need to dispatch repair workers. It's not unusual for businesses to require experts to travel long distances when expensive equipment breaks. Sometimes, poorly repaired equipment must be shipped long distances, too. Existing video chats don't go far enough in addressing the challenge, particularly since they don't allow for easy discussions of things like technical diagrams. "If you really want to literally reach out with your hands and show a person what to do, that doesn't work very well when you simply have a camera pointed at you," he said about the limits of existing teleconferencing. The applications for energy research are just beginning, according to Feiner. The National Renewable Energy Laboratory, for one, completed one of its first AR studies last year. In that case, researchers documented that AR technology prompted supermarket consumers to pick bottled water with an average carbon footprint about 25 percent lower than a control group not equipped with AR on their phones. Steven Isley, the behavioral scientist who led the research, said volunteers at a Colorado supermarket were randomly divided into two groups. A's and B's covered products that most matched consumer preferences based on an earlier survey, including their personal interest in carbon footprint, bottle cost and size. Lower grades popped up over less desirable bottles, as shown in a video tied with the research. The exercise made it easier and quicker to find the sustainable items and reduce the "cognitive burden" of assessing multiple products at once, according to Isley. Without AR, a consumer would have to go bottle by bottle to determine preferences. Environmental labels are not usually available even then. "If you have environmental preferences, you are left kind of groping in the dark about what product is the best for you," said Isley, who is in the process of getting the research published. Augmented reality poses challenges for the energy sector and the environment, too, whether it's Pokemon Go users violating animal habitats or gamers getting in the way of firefighters. Last month, utilities warned Pokemon Go users not to tread near power plants and substations to avoid injury (ClimateWire, July 15). In a blog post last month, Anne Wrobetz of Navigant Research also warned that Pokemon Go could have a large carbon footprint globally, considering all the battery charging and data server power required to satisfy millions of users. "Niantic should take note of its app's energy consumption before rolling it out globally, lest we be trapped in a Diglett-infested desert due to GO-related global warming," she wrote. In its blog, EPRI warned of the potential for hackers to access AR apps and for users to strain their necks, eyes and limbs from being in the same position too long. Simmins said EPRI will be coordinating with its cybersecurity section during the project to examine hacking concerns. It also will assess how much simultaneous AR information bombarding user eyes is too much. "If you remember the 'Terminator' movie, where Arnold Schwarzenegger walks into the bar and you see him bombarded with augmented reality data ... that probably is information overload," Simmins said.